It was 1.5 years after my marathon. I wasn’t running regularly. At most once a week, several kilometers, just for fun, regarding the marathon I had run 2010 as the dream I had realized and not having ambitions about running it faster or another time. It seems too fantastic, too far out of my reach, too far out of this world… Wait a second! Too far? I mean, the guy from the next town did it! And he won! I actually run every week to his town and back, never realized somebody like this lives there, have never met him. But he surely is an extraordinary athlete. The article says he has been running for over 10 years now. He is a tough military man. I have as good as no running experience and no stamina in comparison with that. The marathon was everything I was capable of after months of tough preparation. And now I haven’t been really running for 1.5 years and this desert challenge is a completely different caliber. 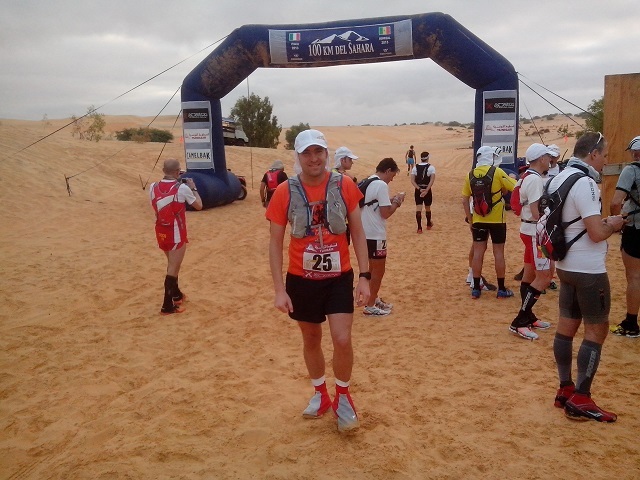 Several weeks pass and the idea of running 100km through the Sahara Desert still occupies my mind. It attracts me magically. I am a diligent student of success philosophy and one of the principles is: If you don’t know how to do something, ask somebody who already did it. And now a striking idea overcomes me: Why not ask Thomas to explain me what I should do in order to accomplish this challenge? I have his name from the newspaper article and I know in which village he lives. Funny as it is I found his phone number in the phone book and I call him. 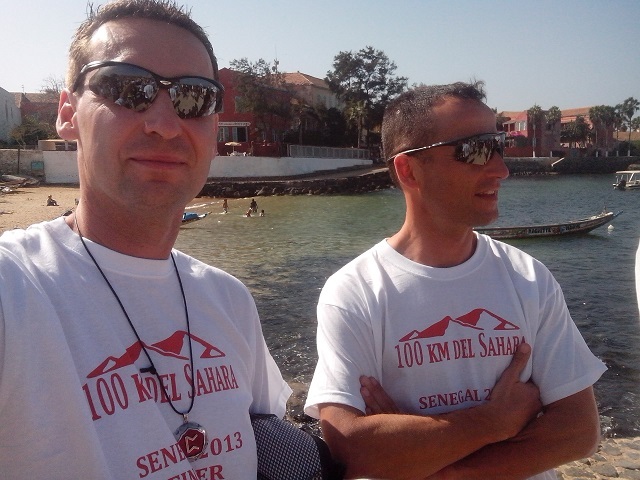 He picks up and I explain him I would like to participate in “100km del Sahara” and invite him for a coffee to talk about this. He asks what my running experience is. My answer: just one marathon. He then, excuses himself for not having much time and if I could call him some other day. Apparently he doesn’t take me seriously. Several days later another excuse and then again. It is pretty discouraging. But then the longer I think about it the more it becomes real to me and the more I realize I really want to do this whatever the hassle of the tough preparatory training. Then a wonder happens: Apparently convinced by my perseverance, or tired by my incessant calls, Thomas accepts my invitation for a coffee. We meet in a nice cafe in my town. His first words, after seeing me are encouraging: “It all isn’t as wild as it appears. You will manage this.” I am surprised and stunned by this unexpected turn. “Remember, I have run just one marathon, and it was almost 2 years ago.” “If you prepare accordingly, you will manage this. You have enough time to prepare for the next edition in the coming year”. I learn I would need to run 30-50km a week starting now and then begin with the intense preparation at latest 3 months before the race, better 6 months before. That’s how he runs. He tells me some entertaining stories from his running career. Something about the hardships of desert running and the injuries you are exposed to. We quickly call each other by our first name and become friends. Then part heartily. The coming months I run more frequently but without a real commitment to this event. I call him from time to time and he asks about my running intensity. I obtain basic stamina, but apparently my performance isn’t promising since he doesn’t take my participation seriously. Then december comes and it is high time to decide whether I participate or not. 3 months left. It is time to start the intense preparation at the latest now if I want to approach this challenge. Without much thought I register for “100km del Sahara” and happily call Thomas to tell him about this fact and to invite him for another coffee to clarify the details. He sounds surprised and asked about it he confesses he didn’t believe I would register. But now, since I am seriously going to participate, we are going to meet and he will help me with the participation. And we meet indeed again. He tells me all the details, how to build the training plan, how to eat, what gear I need and even declares to provide me with some special equipment. It all becomes suddenly so real. And I start the intensive training. I will always remember my father’s reaction when I informed him that I am going to run 100km through the Sahara desert. You need to know, he is 65 at that time. But he is himself pretty extreme in cycling. He spent his whole life with competitive cycling. Sometimes on Saturday he goes on bike with his friend to Austria (270km in one direction), sleeps over and then on Sunday, he comes back another 270km. So 540km in just two days. But when I inform him I am going to run 100km through the Sahara desert, he gets outraged and goes: “You don’t imagine what kind of people compete there. You gonna die there!”. Well it is additional motivation to show him what I am capable of. With a fix training plan it is easy to force oneself to actually do the hard training. And also the increasing intensity of the ultra training doesn’t cause much trouble. This is different from what I remember from my marathon preparation. You run in a more natural terrain, longer but slower, with lower intensity. The load on your muscles, joints and tendons is more varied and it doesn’t tax them that much. Of course you need a special diet and your body weight goes down rapidly. The only obstacle seems to be the cold german winter. But with appropriate clothing and precautions it works without getting sick. Snow is a good simulation of the fine desert sand. I slowly increase my training load from 50km a week to 110km a week. End of January 2013, I go to Gran Canaria for the most intensive training phase. 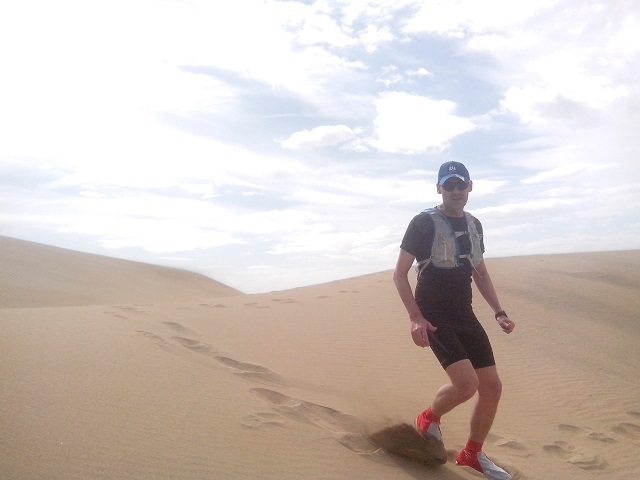 The dunes of Maspalomas are the largest dune area in Europe, it is actually a part of Sahara, so ideal conditions to simulate what is going to await me there. I feel like an alien from the outer space while running on the dunes, where the tourists hardly even can walk. Of course I run with gaiters and a backpack equipped with a water container, which is obligatory for ultra marathon runs. And people look at me as if I were an alien indeed, some weird, unsuitable appearance in this holiday landscape. It is the general test for me. Except for the huge blisters I get, the test goes well and only an injury could stop me now from the participation in the event of my dreams. And I make a funny observation in Gran Canaria, where the dunes sit directly at the beach. Until then I thought running on the beach would be difficult, much more difficult than running on asphalt. That’s right. But now, when I come down from the dunes to the beach, I realize it feels then like if I were running on asphalt. So the dunes are the real thing and the beach seems like a piece of cake. A good sign I would say. But there is another hurdle to take. The unstable political situation in Tunisia, where the event is going to take place. It is 3 weeks before the event and it still isn’t clear if the organizer risks to conduct it due to the security considerations like a high risk of kidnappings. Then the organizer moves the event to Senegal. New schedule is issued. The event can take place but in a different location, on the other side of Sahara. Such is the story of my humble ultra running beginnings and how a fleeting idea became a dream and then reality. I will describe the competition itself in another article. I wonder how this story inspired you. Share your impressions, remarks, conclusions with me and other readers in the comments below. I will also happily answer your questions.